BAY SHORE, Long Island (WABC) -- A 92-year-old war hero was honored Friday on Long Island for his work during World War II. Michael Feeney from Bay Shore was recognized for his role in helping crack the Nazi's infamous Enigma code. Enigma machines were used by the Nazis to securely send messages. 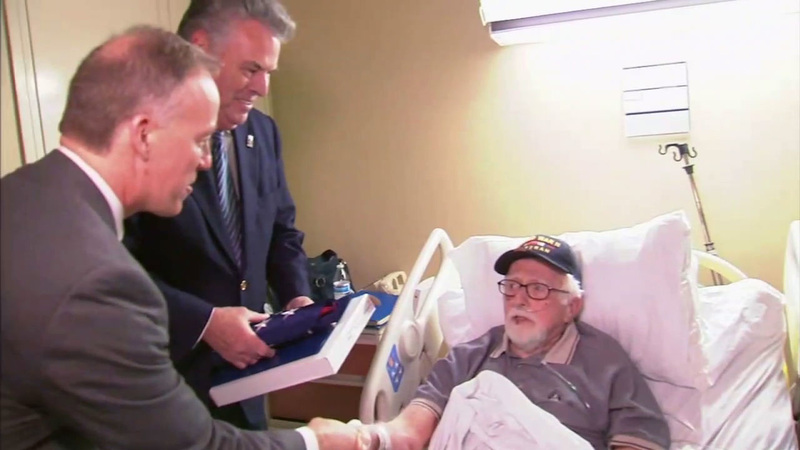 Congressman Peter King and Legislator Tom Cilmi visited Mr. Feeney in his room at Southside Hospital to present him with an award for his military service. Feeney said he never expected Friday's honor. He has been a patient at the hospital since January, but says he hopes to be able to go home soon. @ABC7NY Thank you for helping us make this hero feel special...because he is.